Ogun State was not just nicknamed as the ‘Gateway State’ of Nigeria, it is an appellation well-earned, going by the historic place occupied by the state in the the economic, political, social, and cultural history of Nigeria. From music to medicine, accountancy, civil service bureaucracy, arts, films and culture, music, politics, journalism and activism, Ogun State has played pathfinding roles that have made it the envy of other states in Nigeria. 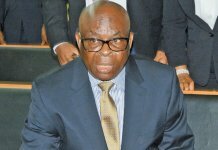 However, recently, the egocentric drive for political expansion, entrenchment and domineering tendencies of the present but transient occupier of the office of the Governor of Ogun State, is not only holding the state back in its strides, but is also, like ripe mangoes, attracting stones and other injurious objects to the sprouting tree. Governor Ibikunle Amosun, whose ego is seemingly taller than his over-sized sky-bound signature cap, is bent on pulling the state down along the route of infamy as recent political events in the State have sent tongues wagging, locally and internationally. It was a shocked world that watched with total disbelief as live pictures and videos were streamed to local and international audience on Monday, February 11, 2019 when the President, Commander-in-Chief of the most populous nation in Africa, Nigeria, President Muhammadu Buhari, was pelted with stones and sachets of pure/poor water at a ‘Presidential Rally’ held in an unpresidential manner in the ancient city of Abeokuta, Ogun State. Buhari’s ‘sin’ was that he dared to raise the hand of the gubernatorial candidate of his party, the All Progressives Congress (APC), Prince Dapo Abiodun, at the rally, which was supposed to be APC’s rally but was hijacked by hoodlums who paraded themselves as members of the budding rival party, the Allied People’s Movement (APM), sponsored by Governor Ibikunle Amosun. That incident in Abeokuta turned out to be the first of such in recent history of Nigeria, where such huge quality collection of political personalities, comprising of a sitting President, the Vice President, National Chairman and leaders of a ruling party, present and serving governors, senators, members and officers of the top echelons of a ruling party at the national level would be stoned in the public and in the full glare of television cameras. Governor Ibikunle Amosun of Ogun State may, after all, be operating from another planet, devoid of present realities. Before the arrival of the President at the rally, the Governor was shown in live video streams, personally supervising the removal of the bill boards, banners, flexes, effigies and other campaign materials of Prince Dapo Abiodun from within and around the MKO Abiola Stadium, venue of the rally. What Governor Amosun lacked in eloquence, logic and political statesmanship and sportsmanship, he actually made up for in political indiscretion, manipulation, compromise and brigandage. He unleashed his attack dogs on anyone and everyone seen wearing the yellow colour caps and T-shirts that are symbols of the APC governorship candidate, Prince Dapo Abiodun, and chased them out of the stadium, just as President Buhari’s helicopter was a few kilometers away from the venue. It was a story of sorrows, tears and blood as defenseless APC members scattered and scampered in different directions. Amosun has told the world that over his dead body will Dapo Abiodun, hitherto his bosom friend and confidant, become Governor of Ogun State. It is an open secret that Amosun already has a lackey that he single-handedly picked and wants to force down the throats of Ogun electorates as his successor. He was even indulged by the President who received his puffed puppet, contesting for governorship on the platform of APM, inside the villa, purportedly on endorsement mission, even when the APM has its own presidential candidate that hasn’t met or stepped down for President Buhari; an audience for which the President was not only criticised but also got ‘served-him-right’ reactions when he was subsequently stoned by APM members in Abeokuta. 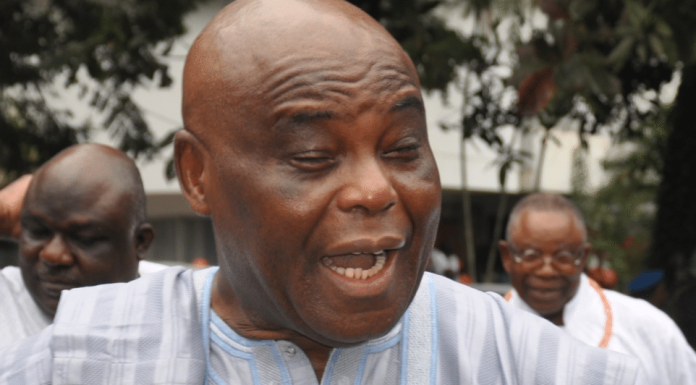 But for huge compromise from the gate to the inner recess of the Villa, what could have granted the Governor, as he openly lamented, 28 times access to a busy Executive President, to push for the selection of his political miniature as the winner of the October 3, 2019 Governorship primaries of the APC in Ogun State, conducted by the National Working Committee of the party, a contest that the whole world knew, he never participated in. The compromise came to the full glare during the preidential campaign when all the security top brass at the event stood with their hands akimbo, as the President and his entourage were booed, stoned, stunned and had to be ferried away under the body shield of their security aides! Not a single arrest was made or has been made by the combined security intelligence operating at the state and national levels. That won’t be the first time anyway. When exchanges of guns boomed for several minutes at the venue of pre-congress meeting of the APC on October 1, 2018 held at MTROS Hall Abeokuta, a stone-throw from the residence of the governor, no one was, or has been arrested in connection with the incident. Many members of the ruling APC in Ogun State, including governorship aspirants, have petitioned the police authorities over threats to their lives. Their petitions have not even been acknowledged, let alone being investigated. Furthermore, when a serving member of the House of Representatives led hoodlums to attack the campaign train of Prince Dapo Abiodun during his ward-to-ward tour of Abeokuta North Local Government on January 31, 2019 and scores of his supporters were severely injured, no one was, or has been arrested in connection with the incident. But the security agencies, especially the police, unbelievably, continue to claim neutrality and professionalism in the handling of these obviously one-sided political attacks being suffered by APC members in Ogun, backed with “executive order”! On the night of the inglorious attack on Mr. President and APC leaders, a lavish party was thrown at the multi-billion naira private residence of the governor, now tagged “White House”, in Abeokuta. The video of the event, led by the APM governorship candidate in Ogun State, has since gone viral. The governor himself drove round the town the following day to thank the people for a ‘befitting reception’ given to Mr. President. He, as usual, dolled out huge sums of money to different categories of people for a job “well done”! He went further to place “thank you” adverts in major newspapers to thank Mr. President for coming to Ogun State. He was also at the Presidential Rally in the Katsina home-state of President Buhari, perhaps the only governor that attended the rally barely few days to the Presidential and National Assembly Elections. The pictures from the Katsina rally have been bandied over the social media by Amosun’s supporters to show that the President was not angry with his ‘untouchable son’ even with the stoning in Abeokuta. 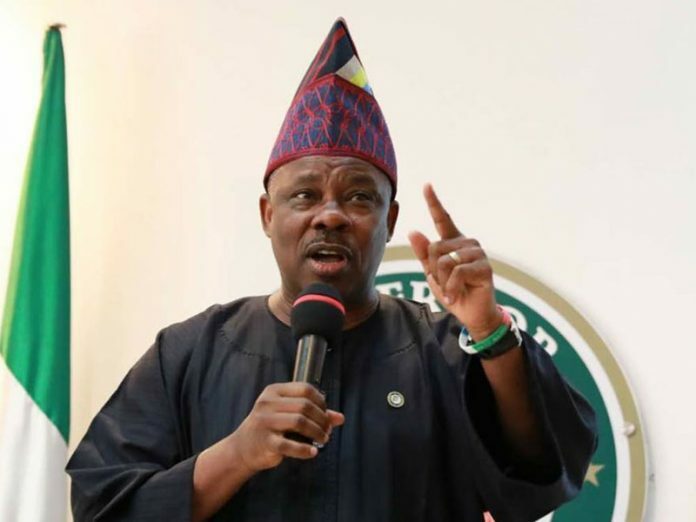 It did not, therefore, come as a “rude shock”, when Governor Ibikunle Amosun sent hoodlums numbering about 50, led by a Council Chief, to disrupt the distribution of the Federal Government’s financial empowerment scheme, tagged “TraderMoni”, to petty traders and artisans at Lafenwa Market in Abeokuta on February 19, 2019. The media reported that the organisers of ‘’TraderMoni’’ had arrived at the market and were documenting the traders’ bio-data with their identities already captured when the hoodlums stormed the venue to disrupt the programme. The Chairman of Abeokuta North-West Local Council Development Area (LCDA), Monsuru Shorunke, reportedly led the hoodlums who chased away the market men and women and whisked their leaders to the presence of the reigning Emperor of Ogun State, Senator Ibikunle Amosun. 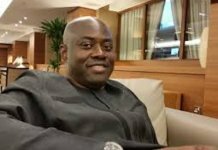 The LCDA chairman, Shorunke, as reported in the media, confirmed that he led some “boys” to Lafenwa on the order of the state governor, Ibikunle Amosun. Shorunke’s outright and care-free condemnation of the FG’s empowerment initiative for petty traders, which has held in different parts of the country, could not have been better said by members of the opposition party. The market leaders returned not long after to be distributing 500 each to the traders as against the N10, 000 each they would have benefited from the “TraderMoni” of the Federal Government. What must have probably escaped the media was that the Vice President, Professor Yemi Osinbajo, was actually expected to give out the handouts to petty traders at Lafenwa Market on the said date. The officials registering the beneficiaries were part of the advance team of the VP. So, in less than 10 days after the incident of stoning President Buhari In Abeokuta, his Vice, Yemi Osinbajo, himself an indigene of Ogun State, was prevented from visiting Abeokuta. What is next on the dangerous sleeves of the spontaneously combustive Governor is dreadfully unknown.